Caption: Micrograph of laboratory-grown rat heart muscle cells. Fluorescent labeling shows mitochondria (red), cytoskeleton (green), and nuclei (blue). This may not look like your average Valentine’s Day card, but it’s an image sure to warm the hearts of many doctors and patients. Why? This micrograph, a winner in the Federation of American Societies for Experimental Biology’s 2013 BioArt Competition, shows cells that have been specially engineered to repair the damage done by heart attacks—which strike more than 700,000 Americans every year. Working with rat heart muscle cells grown in a lab dish, NIH-supported bioengineers at Harvard Medical School used transplant techniques to boost the number of tiny powerhouses, called mitochondria, within the cells. 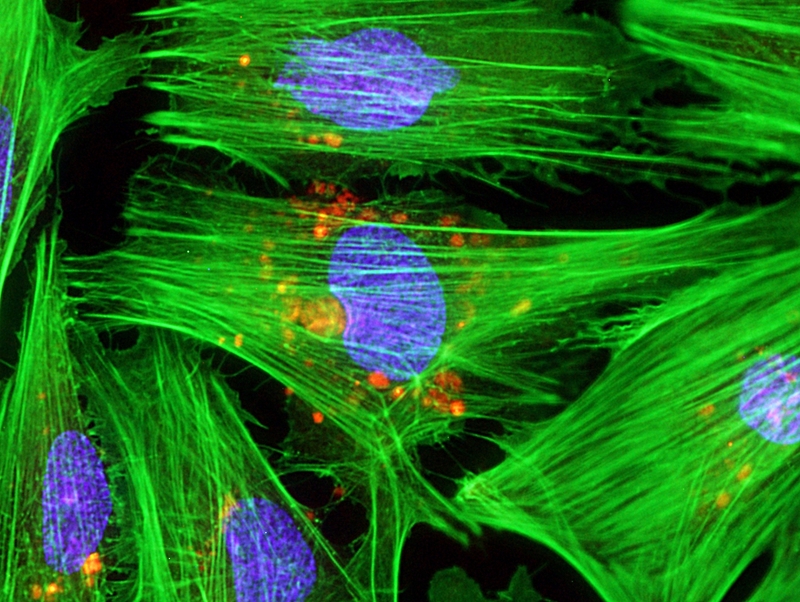 If you look closely at the image above, you’ll see the heart muscle cells are tagged in green, their nuclei in blue, and their mitochondria in red. Why on earth would a heart need extra mitochondria? At least in rat experiments, it turns out that hearts that receive additional mitochondria after a heart attack are more effective at repairing tissue damage and regaining function. The extra mitochondria make this possible by boosting energy generation, which in turn ramps up production of proteins vital for forming blood vessels, spurring cell migration to damaged tissue, and preventing cell death. This approach holds considerable appeal because mitochondria are relatively easy to harvest from liver cells, do not trigger immune reactions when transplanted into heart cells, and could be combined with drugs or other therapies. What’s not to love about that? Transplantation of autologously derived mitochondria protects the heart from ischemia-reperfusion injury. Masuzawa A, Black KM, Pacak CA, Ericsson M, Barnett RJ, Drumm C, Seth P, Bloch DB, Levitsky S, Cowan DB, McCully JD. Am J Physiol Heart Circ Physiol. 2013 Apr 1;304(7):H966-82. February is American Heart Month. Watch NIH celebrate our historic research on heart disease on National Wear Red Day 2014. Imaging the heart can be beautiful and life-saving! Our new infographic, http://go.usa.gov/BmAV, describes cardiac imaging technologies and when a doctor may use them. Early detection can often help prevent more serious health problems later.